Food court flashmob singing "I Love Lunch." 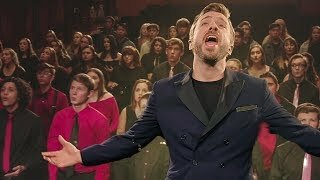 200 kids sing acapella backing up the multiple voices of Peter Hollens on "You Raise Me Up" (written by Josh Groban). The most inspiring cover of "You Raise Me Up" you've ever seen! Talented young violinist plays with remarkable skill and showmanship to a spellbound street audience.